When you commit to a healthy lifestyle, it changes you. Working out and eating right isn’t just about looking a certain way; it’s about feeling a certain way. And, healthy lifestyles (like fit bottoms) come in all shapes and sizes. There’s no one right way to do it — just the way that works for you. Now, there are a lot of brands that are starting to show that message in their apparel and products. There’s workout apparel that’s fashionable and functional for women of all sizes. There’s gear targeted for pretty much any kind of workout you want to do. And while there have always been awesomely cute options for those willing to shell out $75+ for a pair of yoga pants, it’s refreshing to start to see companies offer good quality, inspiring messaging and a really affordable price-point. And after a recent relaunching of its website and product offerings, I have to say: Avia has got a lot going for it right now. The company recently sent us a whole bunch of its goodies to try, along with info on its #FindYourTime campaign (great message there). For a company that started out doing just basketball and running back in 1979, they’ve certainly come a long way. Here are the standouts — and a few things we could do without. I got so many compliments on this tank! It comes in a ton of colors, has a really cool back design with cut-outs and is just the right mix of fitted and flowing to be functional but also flattering. It’s also moisture-wicking and — GUYS — goes for less than $8. Yeah, you can’t beat that. These capris aren’t the most luxurious capris I’ve ever tried on, but for less than $16 they get the job done. They’re tag-free (no chafing issues there), cute, stay put and have enough stretch to make you never want to take them off. And they come in some fun prints — I have the charcoal spacedye you see above, but the acid yellow/smoke print is wicked cute. But, not everything we tried hit it out of the park. A couple of items missed the mark. When I read “seamless” in a description, I’m expecting a fit that is smooth, chafe-free and comfortable. But, man, this sports bra was anything but that. It was scratchy, rough and — honest to goodness — so uncomfortable that I had it on for five minutes and then changed out of it before my workout because it was bothering me so much by just being on. It’s a $13 (actually, down to $8 now!) bra, and, sadly, it feels like it. To be honest, I didn’t even take this out of the package. 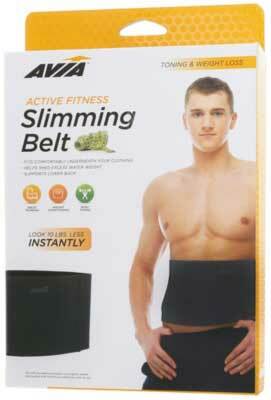 Because, WTF is a slimming belt anyhow? Ugh. A belt for weight-training or core support? Sure. (Which, on the packaging this does say it can do, but it’s obviously not how it’s being sold.) But one to reduce water weight and “slim” you? Well, you guys know how we feel about about all that business. I have actually been pleasantly surprised with the Avia line lately! 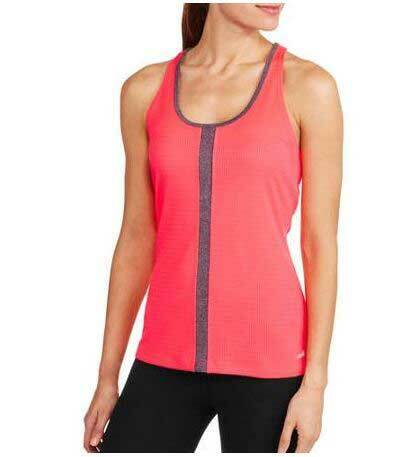 I was not really a fan before, but I’ve got the same tank (in a few colors) and capri’s that you mentioned and my thoughts are pretty much exactly the same as yours. I’m that person who is incapable of walking into a store and avoiding the workout clothes (I have to walk through every. single. time.) and I can usually find a good deal from Avia. My one caution, though, is that I feel like in order for the tanks to be flattering, I really need to be conscientious about which size I get (and it’s not always the same size in every style). As long as I take the extra 5 minutes to be smart about it, I’m usually satisfied.